Located centrally within Bonita Bay Golf and Country Club is Ibis Cove at Bonita Bay. Ibis Cove is a neighborhood of twenty-eight single family homes. The homes in Ibis Cove were constructed between the years of 1994-2002. The sizes of homes in Ibis Cove range from about 3,500 to over 6,000 square feet of air conditioned living space. The community of Ibis Cove at Bonita Bay is located within walking and biking distance to the Marina Club at Bonita Bay and dining at Backwater Jacks. 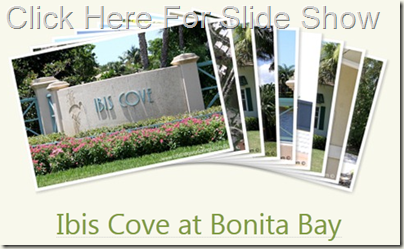 In addition, Ibis Cove is within close proximity to the walking path system of Bonita Bay. Ibis Cove at Bonita Bay consists of three streets; Ibis Cove Ct., Green Heron Ct. and Plumage Ct. The streets of Ibis Cove wind gently and are lined with mature oak and palm trees. Due to the year in which the Bonita Bay community was developed the homes in Ibis Cove at Bonita Bay enjoy larger lots and room around the houses. The views of homes in Ibis Cove include lake views, wooded area landscaped views or a lake marsh view. Each home in Ibis Cove has it’s own private swimming pool. Ibis Cove is now built out and there is only resale real estate available. Home owners in Ibis Cove at Bonita Bay also enjoy the fabulous amenities of Bonita Bay which include three interior parks which are exclusive to residents, the beach park on Hickory Blvd, tennis, walking paths, secure gated living with manned guard stations and patrols, plus the option to purchase a house (social) membership, Bonita Bay Golf membership or a sports and fitness membership. There are usually very few, if any, homes on the market in Ibis Cove. Other neighborhoods in Bonita Bay with similar real estate offerings to Ibis Cove at Bonita Bay include: Woodlake at Bonita Bay, Rookery Lake at Bonita Bay, Deerwood at Bonita Bay and Oak Knoll at Bonita Bay .